Second, I have been working with Bill Bachrach and I am excited to share with you a new program to help you build your ideal client acquisition process. The program is called the “AdvisorRoadmap™ Virtual Training Platform”. 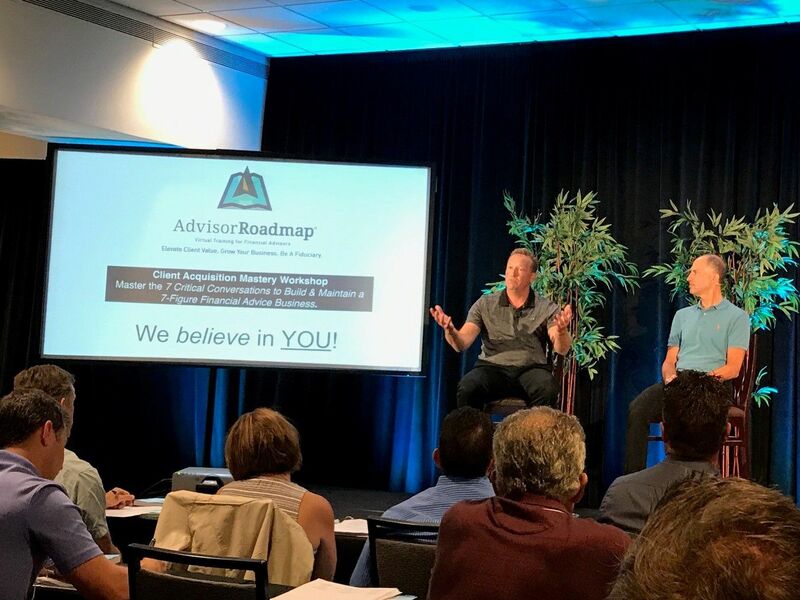 I've gotten great feedback about Bill’s training, but for those of you who really want to grow your business, how do you know if Bill's AdvisorRoadmap™ program is for you? ● If you have never charged an up-front fee for planning, but would like to start. ● If you charge an up-front fee for planning but want those fees to be bigger. ● If you have ever been frustrated with clients who procrastinate or don’t implement all of the advice from your planning process. ● If you would like to be more effective at acquiring new clients who pay a fee that aligns with the true value of your planning from the beginning of the relationship. ● If you would like to learn how to convert existing clients to full-service, fee-paying financial planning clients. ● If you would like to have a repeatable process that inspires clients to consolidate all of their money and financial services business with one advisor: YOU! ● If you like the idea of dramatically simplifying your life while simultaneously increasing your income by having a smaller number of clients (50 or fewer) who each pay you 5-figures per year for planning, advice, and accountability. ● If you would like for prospects and clients to come to your office, with all of their financial documents, and their spouse for the first, and every, meeting. Inside of the member's area, you'll get instant access to interactive training courses, videos, scripts, demonstrations, and high-value resources to help you master the repeatable processes that are crucial to acquiring and serving Ideal Clients. For a fraction of the value of one good client, you get a lifetime of proven training to attract and serve ideal clients. What kind of impact can this training have on YOUR business? You will be *kicking* yourself if you go to another meeting where you don't sign up the client in the first meeting and you wonder what could have happened if you would have learned a process that's been proven to work over and over again.You can get started today, learn the process, set up appointments using the scripts we give you, and start getting more clients, or elevating the value of your existing clients. Join now and I look forward to hearing your success story! I am extremely confident the training you'll go through the inside of the AdvisorRoadmap™ Virtual Training Platform will help you capitalize on all of the disruptions happening in the industry right now, and will get you to your goals faster. Enroll now or email me at grant@ghicks.com if you would like more information if this is right for your practice.